The short-term outlook is benign with private consumption expected to increase by more than 6% in 2018, but higher inflation could have a dampening effect. Solid demand, as the sector benefits from robust consumer spending growth, driven by robust economic performance and strong wage increases. The short-term outlook is benign, with private consumption expected to increase by more than 6% in 2018. 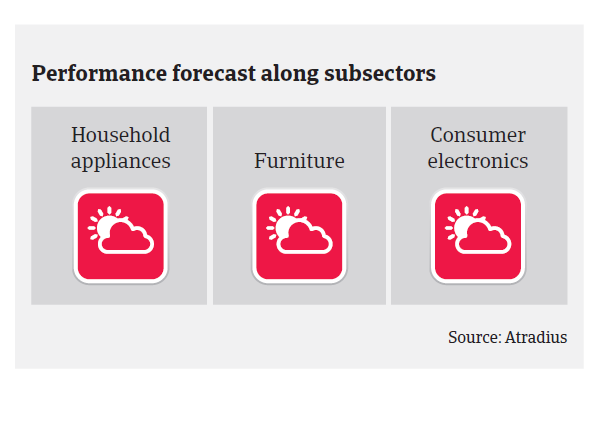 While this and higher disposable household income will spur consumer durables sales growth, rising inflation could have a dampening effect. Competition in the market is fierce due to relaxed regulations on foreign investment, which has led to an influx of foreign retailers trying to gain market share. Nevertheless profit margins of most businesses are expected to remain stable in 2018. The current average payment duration in the industry is 30-60 days. Payment behaviour has been rather good over the past two years, and payment defaults are expected to remain low in 2018 due to the robust economic performance. The level of business insolvencies is low and no increase is expected in 2018. Due to the benign business and credit risk situations our underwriting stance is generally open. However, more caution is advised with highly geared businesses that have sub-par profits. Companies in the household appliances and wholesale segments tend to be highly geared as credit growth has increased, helped by lower interest rates. The risk of downward pressure on profit margins could be aggravated by rising competition in the consumer durables retail market. High GDP growth of more than 6% in expected in 2018 driven by domestic demand and exports, but the economic fundamentals still show some weaknesses.